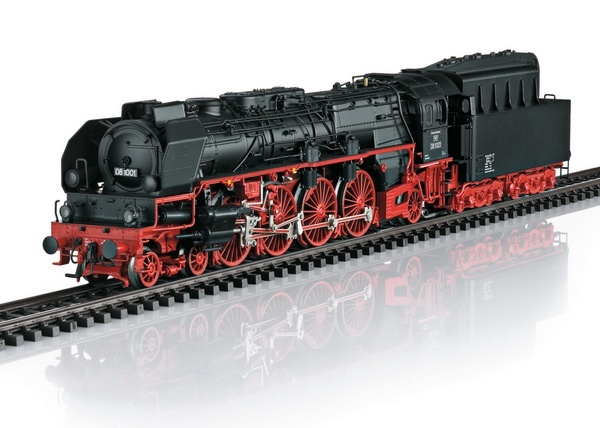 Model: The locomotive has an mfx+ digital decoder and extensive light and sound functions. It also has controlled high-efficiency propulsion with a flywheel, mounted in the boiler. 4 axles powered. Traction tires. The locomotive and tender are constructed mostly of metal. The model has a factory installed 72270 smoke unit. The dual headlights on the locomotive and tender change over with the direction of travel. They and the built-in smoke unit will work in conventional operation and can be controlled digitally. There is also cab lighting and running gear lights that can be controlled digitally. Maintenance-free warm white LEDs are used for lighting. There is an adjustable coupling with a guide mechanism between the locomotive and tender. The rear of the tender has a close coupler in an NEM pocket with a guide mechanism. The minimum radius for operation is 437.5 mm / 17-1/4“. Brake hoses, heating lines, and imitation prototype couplers are included. Length over the buffers 29.4 cm / 11-9/16“. After the end of World War II, the GDR German State Railroad (DR) found it had a "foreign locomotive" of French origin with the SNCF road number 241 A 21. As a development of the French East Railroad (EST), it came from a series of 40 units built in 1931/32 and it had four-cylinder compound running gear. Due to the excessively high repair cost, there was little effort by the DR to put French design locomotives back into operation. 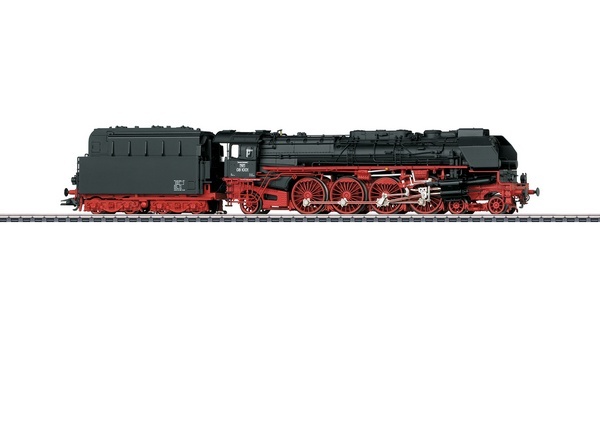 Yet the "Powdered Coal Collective" around Hans Wendler and Max Baumberg, the future director of the Vehicle and Experimental Institute (FVA) in Halle (starting in 1960 VES-M Halle), were able to requisition this express locomotive for their needs due to its special design. 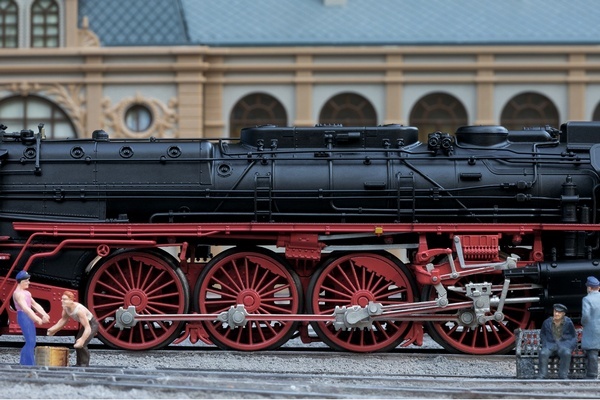 With its 12.25 cubic meter / 432.60 cubic foot combustion area and the 2,248 mm / 88-1/2 inch long combustion chamber it was ideally suited for conversion to powdered coal firing, since for powdered coal firing this gave it a desirably long burnout path for the powdered particles. Road number 241 A 21 thus stayed starting September 17, 1951 at the "October 7th" maintenance facility in Zwickau and was equipped with Wendler powdered coal firing accompanied by a reduction in its boiler pressure from 20 to 16 kp/cm² / 284.46 to 227.57 PSI. The powdered coal firing required among other things the removal of the ash box as well as the installation of a second air compressor and an additional main air tank for pneumatic dust extraction. In addition, the locomotive was adapted to the DR's operating conditions. 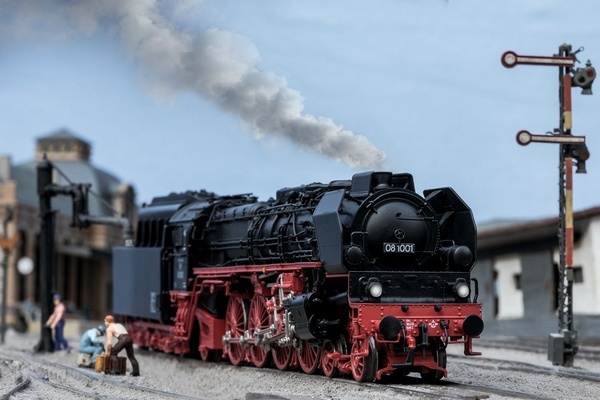 This included shifting the cab from the left to the right side of the locomotive as well as equipping the locomotive extensively with standard German appliances and parts. It was coupled to a type 2'2'T34 standard design tender converted to a type 2'2'T28 triple chamber powdered coal tender. 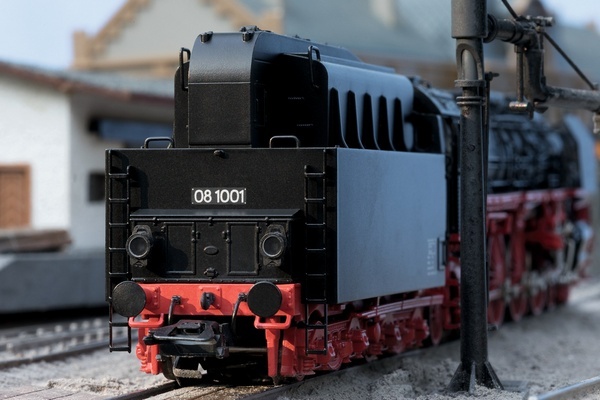 The locomotive now designated as road number 08 1001 went first to the maintenance facility at Berlin East Station after being completed in July of 1952. Here it was scheduled to pull the D 13/14 pair of express trains to/from Stralsund with the start of the winter schedule on October 5, 1952. The records of locomotive supervisor Specht at the maintenance facility at Berlin East Station reveal the following: On October 8, the unit came early from Leipzig and hauled the D 13 to Stralsund without maintenance. Despite "bad" powdered coal, the steam generation was good. Like the run out, the run back also occurred without problem. Another run on October 10 also gave no cause to complain and locomotive supervisor Specht noted: "Best steam generation. Bunkers 2+3 were still about 80 cm / 31 inches full on arrival in Stralsund." After transfer to the FVA in Halle in February of 1953, intensive test and measurement runs were done that resulted in many new findings. Finally, road number 08 1001 went as a kind of Christmas gift on December 24, 1953 to the Dresden-Altstadt District in scheduled use. Its maintenance intensive de-Glehn running gear, the multi-part crank axle as well as the general difficulties in procuring spare parts lead however on June 18, 1955 to it being put into storage. A refurbishment overhaul remained undone and on November 15, 1957, it was finally retired. This model can be found in a DC version in the Trix H0 assortment under item number 22912.